Wendi Deng deserves credit for containing husband Rupert Murdoch's worst impulses. Not only did her fearsome bodyguarding distract the world from hubby's hacking scandal, it's now clear that she preserved a friendship with Google that Murdoch tried to explode. The prototype is incubating, but still under wraps. A recent picture of Larry Page's wife reveals that the Google CEO is expecting a second child. Just don't expect Page, the taciturn computer scientist, to reveal much about the baby. Larry Page is now the co-creator of something other than the most important internet site in the world: A tipster whispers the Google co-founder is the father of a baby boy, as of Thursday. Larry Page, the dorkier half of Google's founding duo, has mastered at least one basic human function: His wife, former model and Stanford bioinformatics Ph.D. Lucy Southworth, is pregnant. Lucy Southworth made the cut at AOL's Asylum blog, even though hubby Larry Page isn't the CEO of his company. If you don't want to click through Asylum's pop-up interactive preso, I searched our photo databases to find real-world shots — not Photoshopped promo pictures — of Asylum's two other Valley-related picks. Both have a certain something once considered unsightly on a trophy wife: careers. Google helped pay for this weekend's launch of a satellite which will take high-resolution imagery for its Google Earth service, and founders Larry Page and Sergey Brin were on hand to watch the rocket lift off at Vandenberg Air Force Base. Serious business, right? Not when you see our spy photos of the billionaires. Brin wore bright orange Crocs and Page wore a red windbreaker. More tellingly, Brin brought Anne Wojcicki, his pregnant wife, and Page brought his wife Lucy. Both women also dressed informally. Wojcicki carried a plastic water bottle — funny, I thought Larry and Sergey had gotten rid of those at the Googleplex. It all looked like a lark for the billionaire couples, rather than a visit to a high-security military installation — paid for by Google's shareholders and U.S. taxpayers. At least Larry and Sergey seem to have flown their on their own dime — the photos show a Gulfstream V, one of the models in the Googlers' fleet of party planes. Admit it, you all wish you were Larry and Sergey, Crocs and all. Lucy Page, the bioinformatics-expert wife of the Google cofounder, would seem to fit the Forbes template for billionaires' wives: "Looks are great — but brains are even better." Unlike husband Larry — shown here kissing his bride at their Necker Island wedding — the former Lucy Southworth actually completed her Ph.D. at Stanford. But a revelation from sister Carrie Southworth, an actress, may mar Lucy's Valley-brainy reputation. Before Lucy Southworth met Larry, there was another man in the future Ms. Page's life: Tom Kretchmar. From a photo album on Facebook, leaked thanks to the site's privacy holes, we can see Southworth and Kretchmar were close. In one photo, she's sitting on his lap. Old college flame, or just a friendly school chum? Never mind: Southworth is too radiantly adorkable for me to pay much attention to Kretchmar. Anne Wojcicki, the wife of Google cofounder Sergey Brin and CEO of the Google-funded biotech startup 23andMe, is a modern sort, keeping her name after marriage. Not so, apparently, for the former Lucy Southworth, who recently married Brin's cofounder, Larry Page. At the World Economic Forum in Davos, her nametag read "Lucy Page." One thing's for sure: This will make her more difficult to Google. We hear that Larry Page's wedding to Lucy Southworth on Necker Island Sunday was a smaller affair than widely reported — only 170 people, not 600. Confirmed in attendance: Richard Branson, who officiated, and Bono, who read a poem he wrote for the couple and performed a song. Oh, and also San Francisco's hunky god-mayor, Gavin Newsom, shown here with Page and Google cofounder Brin. How do we know Newsom was there? No wind, no rain could stop Larry Page and Lucy Southworth's wedding on Necker Island this weekend. During the ceremony itself, Valleywag's exclusive photo showed clear skies, if rough seas. Virgin Gorda, the large island where the Google founder and his Stanford-Ph.D. bride held a reception afterwards at Little Dix Bay, hosted a large fleet of private jets over the weekend — all gone by now, according to our operatives. From a helpful tipster, the first-ever photo from the wedding ceremony of Larry Page and Lucy Southworth. The groom wore a white buttondown shirt, untucked; the bride, a cream strapless number, with her hair loose. Pics or it didn't happen, eh? After the jump, visual confirmation that Sir Richard Branson was the Google cofounder's best man. In the neutral parlance of stormtrackers, the pattern of rain and winds now hitting the British Virgin Islands is just a "tropical disturbance." But I have to think Google cofounder Larry Page, who married Lucy Southworth yesterday on Richard Branson's Necker Island, is more than disturbed by it. Gale-force winds and heavy rains will make it difficult if not impossible to shuttle from island to island, and conditions may be unsafe for helicopters and small private jets to take off. Hundreds of celebrity guests and top Google executives may well be stranded. I should have taken my colleague Paul Boutin's recap of the week as a warning. Normally I take the weekend off, and I shouldn't have made an exception. But that Lucy Southworth is just so geekily adorable in this Stanford-office photo I felt obligated to cover her wedding. If it happened. So how are Mr. and Mrs. Larry Page faring? The coconut telegraph linking Valleywag's Virgin Islands correspondents with headquarters in San Francisco is down. Our sources who promised us an inside look at Larry Page's wedding to Lucy Southworth, believed to be taking place right now on Richard Branson's Necker Island, have been silent since this morning. And now I think I know why: What may be a tropical storm system is forming northeast of the archipelago. After the jump, a shot taken today by a Valleywag informant showing the extremely windy conditions there. Yesterday was a beautiful day in the British Virgin Islands, as you can see from this sunset snap submitted to us. And strangely quiet. That's because, we hear from a source working the festivities, Larry Page and Lucy Southworth didn't get married. 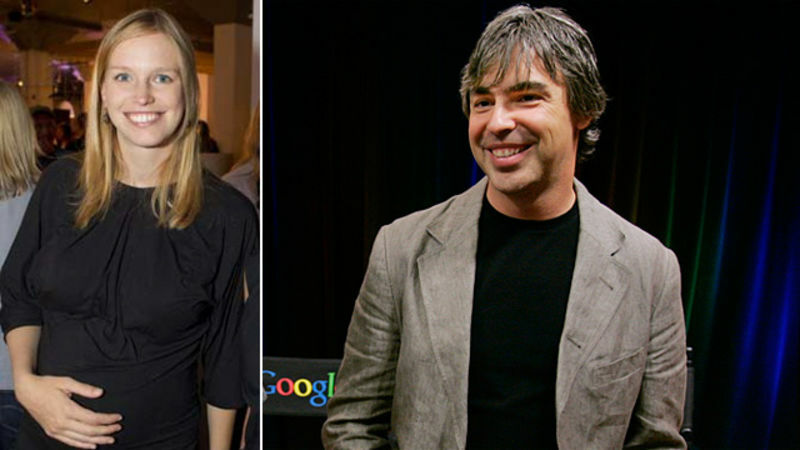 If rumors are correct, Larry Page and Lucy Southworth should be married by now. One hopes that they're back to a suite on Richard Branson's Necker Island resort, recapping their mile-high makeout session from last year. Update: Or not! The latest rumor from the coconut telegraph: The wedding is Sunday, not Saturday. One hopes the future Pages are practicing for tomorrow, at any rate.